Producing Display Stands with passion since 1991..
1-Definition; The most efficient and functional type of required display stands are together determined with the clients according to their requirements. 2-Design; The 3d designs of display stands are made according to their manufacturability, costs, visuality, logistics and their functionality at point of sale. 3-Prototyping; We rapidly produce the samples of approved display designs for the evaluation of the clients. 4-Pricing; The pricing for possible order quantities are made according to the raw materials, production and overhead costs of the display stands. 5-Manufacturing; The serial production are immediately started after the approval of the designs, samples and price by the clients. 6-Improvement; The functionality and durability of the display stands are continuously improved for future orders from the feedback at point of sale. Display Stands are commonly used as a tool in order to ensure sales of certain related products at point of sale. Display Stands could be manufactured from desired materials such as metal, wood and plastic. The most important features that Display Stand should have are; attractive appearance, convenient and easy to install construction and disassembly in order to have low transportation cost. Display Stands can be produced in varieties such as floor, tabletop, wall-mounted in order to meet the demand. It's never been easier to create your own Display Stand design. 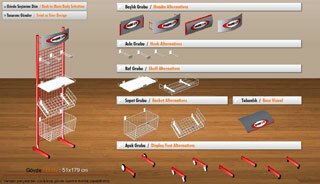 Start creating your Display Stand by clicking here or image below. Copyright © Başer ltd. 2016. All rights reserved.